I'm so excited about this cake! 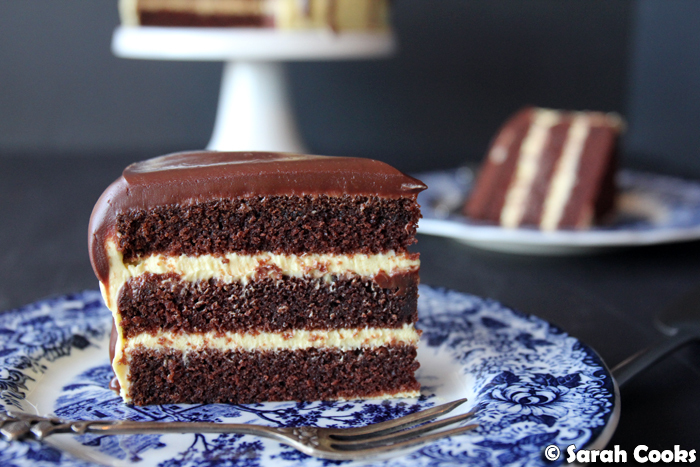 A fancy, pull-out-all-the-stops chocolate layer cake. We've got fluffy yet rich chocolate cake layers, sandwiched with a thick and fruity passionfruit cream, slathered in rich chocolate ganache. Passionfruit and chocolate - one of my favourite flavour combinations! 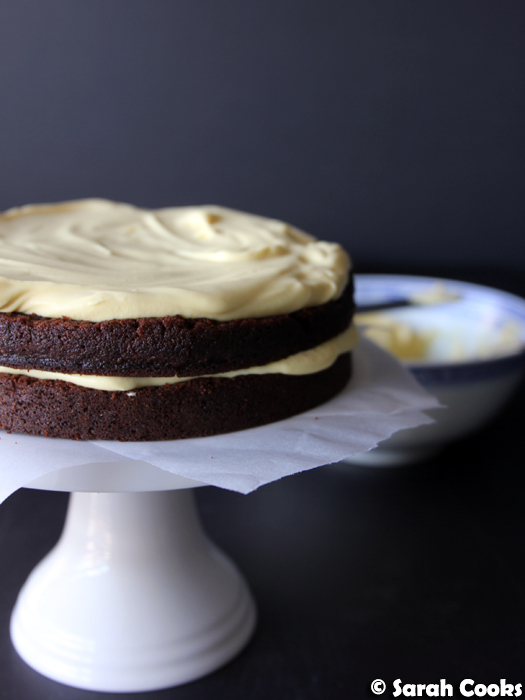 If you've followed my blog for a while, you might know that I'm not usually a layer cake person. However - this little ol' blog turned fourteen on Sunday, and I really wanted to celebrate with a fancy cake! FOURTEEN years! Back when I started food-blogging in 2004, the blogging world was a totally different landscape. Well, to start, there wasn't really a huge "blogging world" at all; certainly not a food blogging world. No iPhones, Instagram, Twitter, or Facebook. (Actually, I think Facebook existed, but was limited to just college students at that time). There were no PR approaches, no sponsored posts, no influencers, no aggressive GETFOLLOWERSNOW accounts sliding into your DMs. No DMs! Back then, we just had those free blog-publishing services that us fringe weirdos would sign into to share our thoughts and feelings with anyone prepared to read. I literally started this blog as a way to express my foodie leanings without boring my friends - and fourteen years on, even though foodie culture and online sharing has definitely become mainstream, I must admit I still think of my foodieness as a bit of a quirk, and when asked about my food blog, I often reflexively talk it down as a niche hobby rather than a body of work of which I'm proud. I'm still working on that. So let's get back to the cake. The combination of passionfruit and chocolate is one of my favourites, and has been ever since my great friend Clarice introduced me to the Pierre Hermé mogador macarons back in 2006 when we were travelling through Europe. Those macarons are now a must-purchase any time I visit Paris! (Those of you lucky enough to have tried Duncan's macarons during his all-too-brief foray into commercial macaron production in 2010 may have also tasted his divine white chocolate passionfruit macarons, aptly titled the "Zara"). 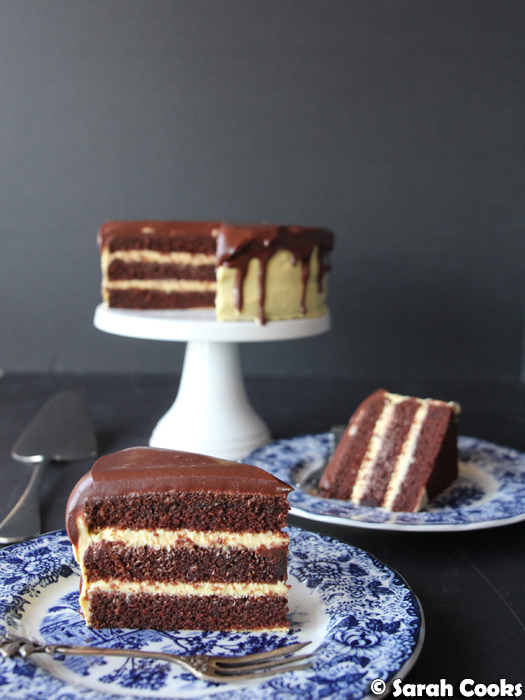 I used my go-to chocolate cake for the layers: Nigella's chocolate fudge cake. (I also used this as the layers one of my other layer cakes, the wordy but delicious cocoa sour cream cake with chocolate cheesecake icing and raspberry whipped cream). 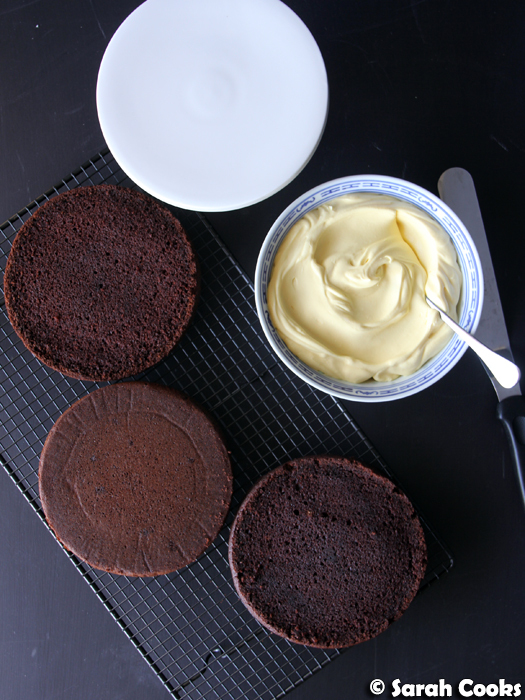 To make a small layer cake, I make it in half quantities and bake it in a little 18-cm springform tin. It works a treat! 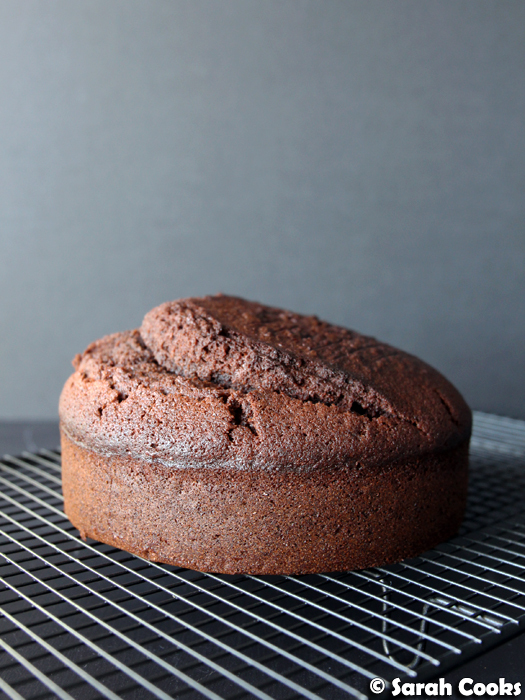 The cake has a rich chocolate flavour, and the texture is light and fluffy, but still firm enough to slice horizontally without falling apart. Winner. Cocoa sour cream cake - yes that dome had to be sliced off, but yes, that means I got to eat it while assembling the cake. The passionfruit component comes via the icing. The passionfruit cream is super-simple to make, but does require a little specialist shopping, as you need freeze-dried passionfruit powder. (I got it at a specialty cooking store, but Google it to find stockists near you - it's worth searching for). I learned the technique for the icing from the wonderful Stella Parks, where she blends freeze dried fruit with sugar and cream in a food processor. This makes a super smooth, velvety and stable cream, that doesn't collapse or weep even after a few days in the fridge. It's sturdy enough to be used as cake frosting, with an intense and pure flavour. She is such a legend! The passionfruit powder lends a pale yellow colour to the cream, but I added a few drops of yellow food colouring as well to enhance it. Before we get into the photos of assembly, I'll let you know that the cake isn't difficult to make, it's just quite time consuming, as there's a lot of resting involved to ensure a neat result. You have to make the cake, and let it get completely cold before slicing. As you assemble the cake you need to chill it in the fridge at least three times - once after the crumb coat, once after the final layer of icing, once after covering it in ganache. It took me the better part of my whole Sunday to make the cake (which I don't mind; I love baking!) But in the normal run of things I'd suggest breaking up the activities - baking the cake and making the cream on one day, and assembling the next. (I actually think this would work better, as the cream thickens on standing. You'll see in some of my later photos that my second coat of frosting was a bit slippery and messy, a night in the fridge would have definitely benefited the cream). With that out of the way, let's look at the assembly! Smoosh a little frosting onto your cake plate, and press your first layer down onto it. This will stop the cake moving around too much. And slip some pieces of baking paper under the edges of the cake to keep it neat. Then you start spreading and stacking! If it's a warm day or your cake pieces look like they're going to slide around a lot, pop the whole thing in the fridge to firm up again before continuing. The top layer of the assembled cake should be the layer that was on the bottom of the cake as it was baking. This ensures the top is nice and flat, and means you'll get less crumbs in the icing. And speaking of crumbs in the icing, here's the cake after the crumb coat. Basically to "crumb coat" a cake, you cover it all over in a thin layer of icing, and pop it back into the fridge to set. This creates a barrier between the cake and the icing, and means you get less crumbs on the outside of your cake. And here is the fully-iced cake. 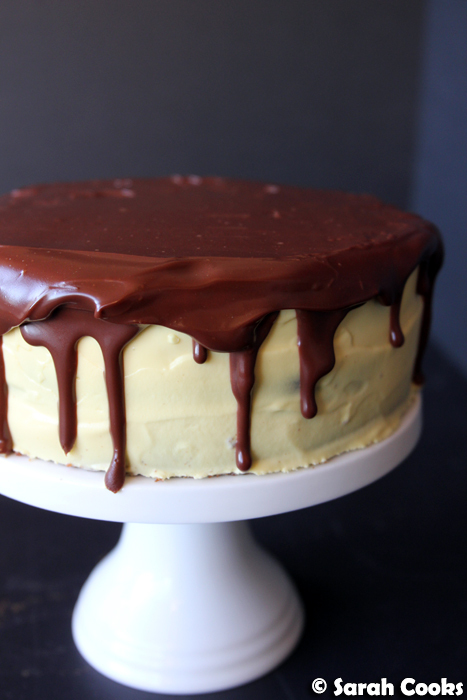 I drizzled the cake with a dark chocolate ganache, for more chocolately deliciousness. It's really important that the cake is fridge cold before you do this, and that the ganache isn't too hot, otherwise it will melt the icing. Slightly warmer than body temperature is just about right. 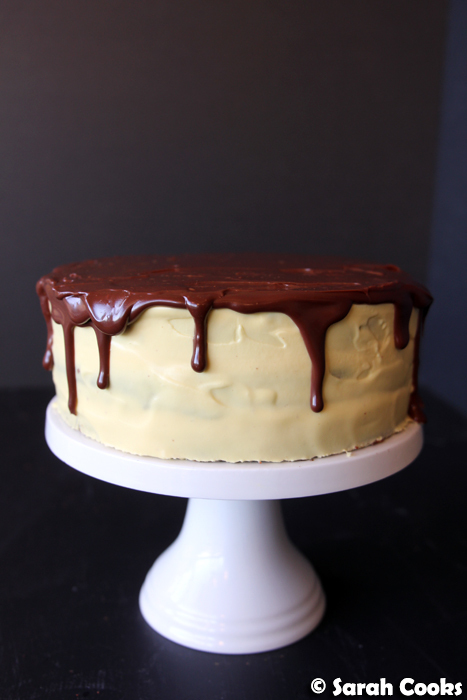 I found a great tip from Brooklyn Homemaker to apply the ganache: he uses a squeezy bottle to pour the ganache around the edges, to get more attractive looking drips. I only had a ziplock bag but it worked well! 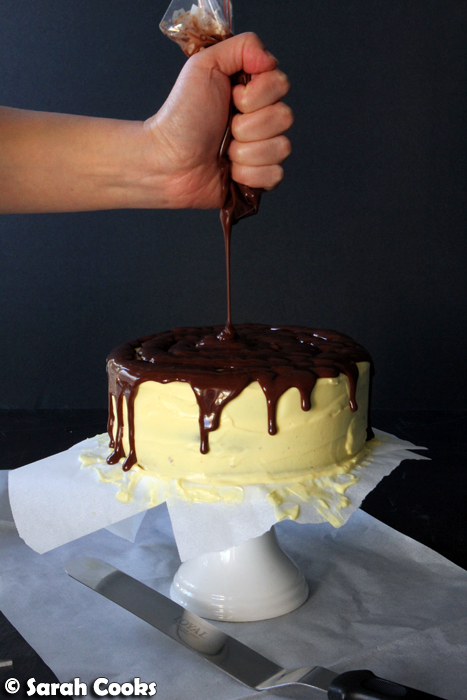 (PS another option is simply to pour the ganache over the cake, spread it out gently, and let the drips form where they will). Done and done! Again, pop it in the fridge and wait until everything's set before gently easing out the protective sheets of baking paper, and then slicing it. 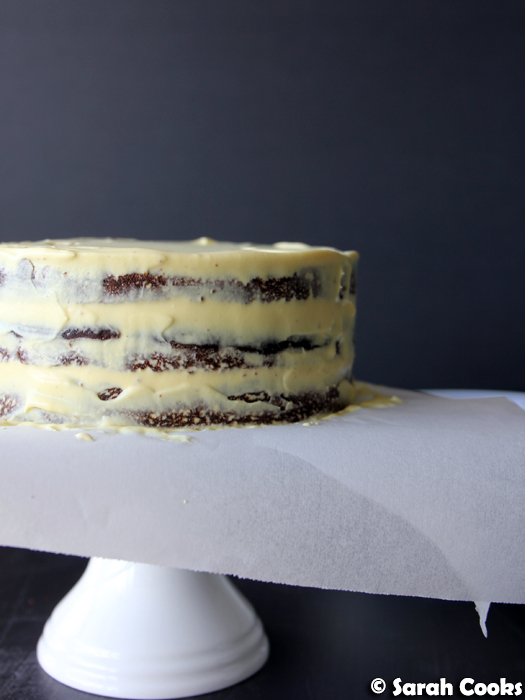 I don't have lots of experience making layer cakes (and I've had some failures that haven't found their way onto the blog! ), so it was pretty nerve wracking cutting into the cake. I was so pleased and proud of myself that it turn out nicely! Check out those neat layers! The moist crumb on the cake! The even lines of icing between the layers. Woohoo! Making this cake has definitely increased my confidence - I think I'll be baking layer cakes more often from now on! Looks are great but for me, the most important part of any cake is the taste. And this one tasted awesome! The contrast between rich chocolate and sour passionfruit is just out of this world! 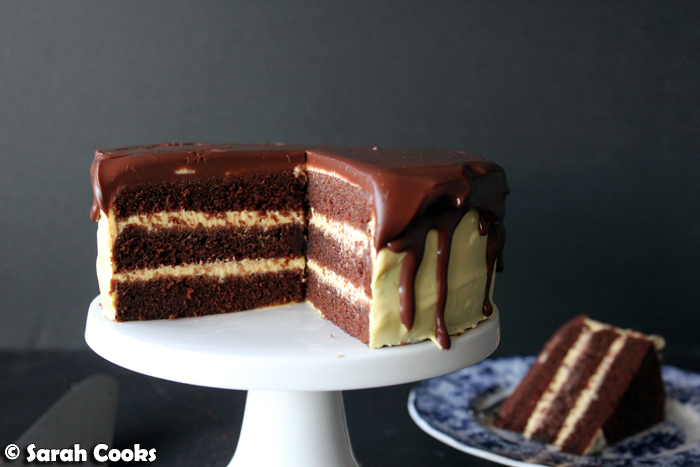 The layers and ganache are chocolatey and rich, and the passionfruit cream cuts through the richness and stops the cake from being heavy or cloying. It's all too easy to inhale a giant slice of this cake. It's a bit of a showstopper and is definitely worthy of a special celebration, but it's lovely as dessert or afternoon tea as well. Basically, what I'm saying is that any excuse will do. Thanks to everyone who's been reading my blog over the last fourteen years! Line the base and sides of an 18cm springform tin with baking paper. In a large bowl, mix together the flour, sugars, cocoa, baking powder, bicarb, and salt. (If they're lumpy, I suggest sifting the cocoa, baking powder, and bicarb). In a measuring jug or other bowl, whisk together the eggs, sour cream and vanilla. In a third bowl, whisk together the melted butter and vegetable oil, followed by the chilled water. 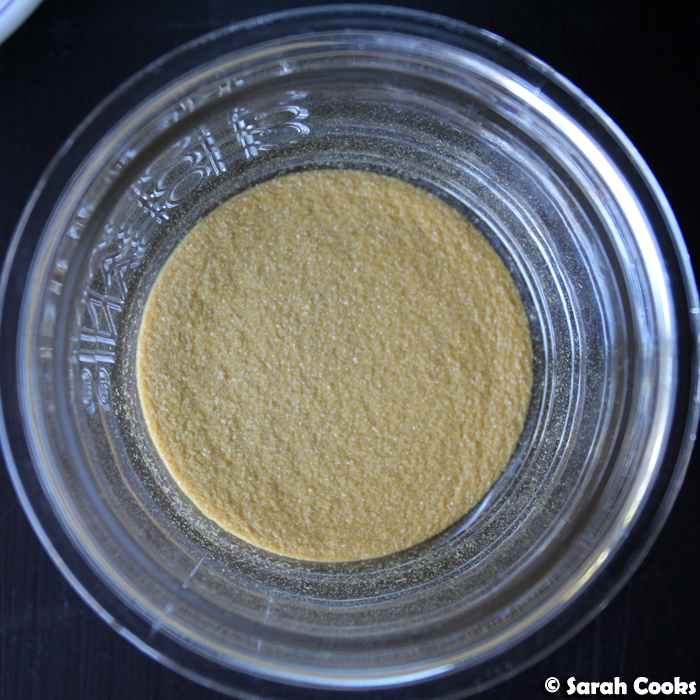 Add the dry ingredients to the melted butter mixture, and beat with a wooden spoon until blended. Add the egg mixture and mix until blended. Pour the batter into the prepared tin, and bake for 45-50 minutes, or until cooked when tested with a skewer. Place the passionfruit powder, caster sugar, and cream in the bowl of a food processor. If you like, add a drop or two of yellow food colouring to enhance the colour. Pulse until thick and creamy like Greek yogurt, just under two minutes. Don't overwhip or it will become butter. 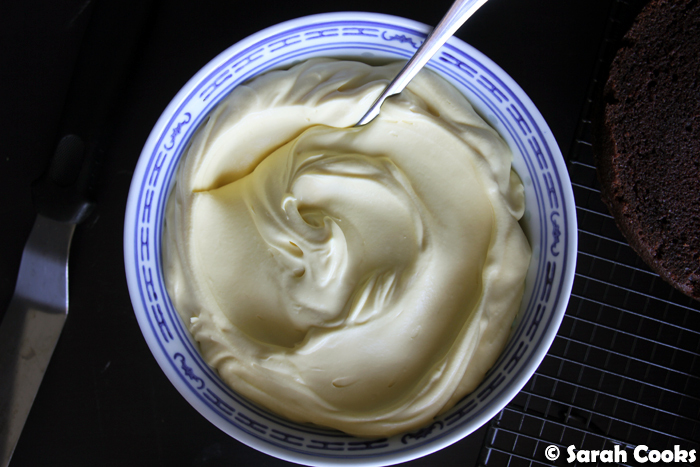 Scrape the cream into a bowl, cover with cling film and refrigerate. Slice the dome off the cold cake to flatten the top. Slice the cake horizontally into three even layers. If the layers aren't completely cold, place in the fridge until completely cold. Place a small dollop of passionfruit cream on a cake plate or cake stand. (This is to stop your cake layers from moving around as you decorate). 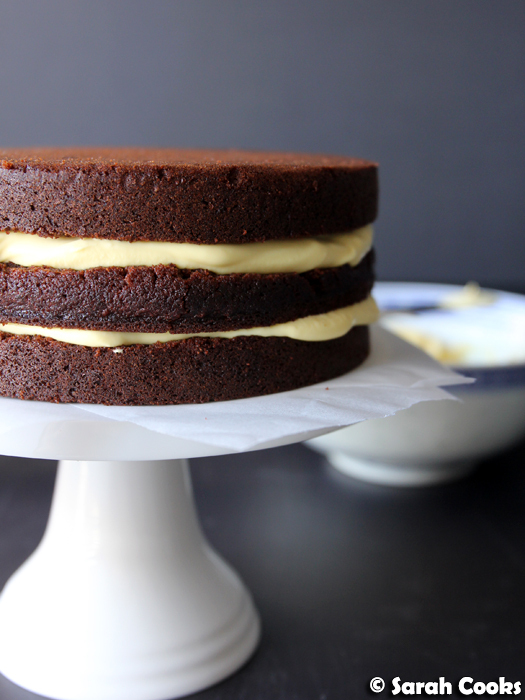 Place one cake layer onto the plate and press down gently. Slide four strips of baking paper underneath the cake around the edges. (This is to protect your plate from messy icing smudges). 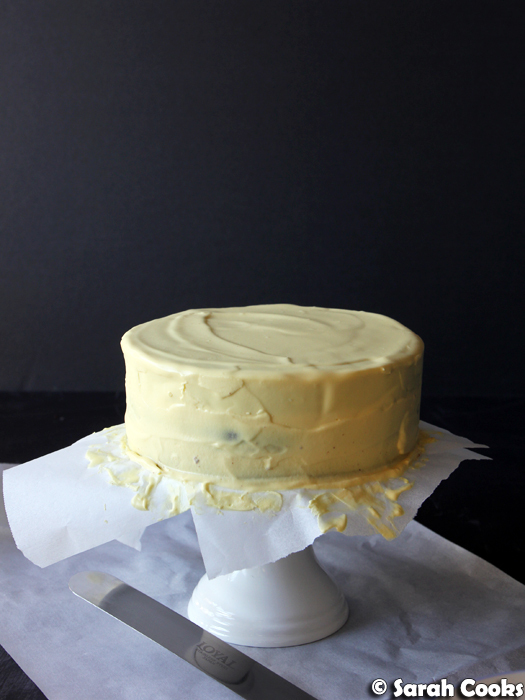 Spread about 1/2 cup of passionfruit cream on top of the cake layer with an offset spatula. Place a second layer on top and press down gently. Spread another 1/2 cup of passionfruit cream on top. Place the third layer on top and press down gently. Make sure the layers are even and sitting directly on top of each other. Once the cake is thoroughly chilled, you can cover the cake in a thicker layer of passionfruit cream, using the same method. 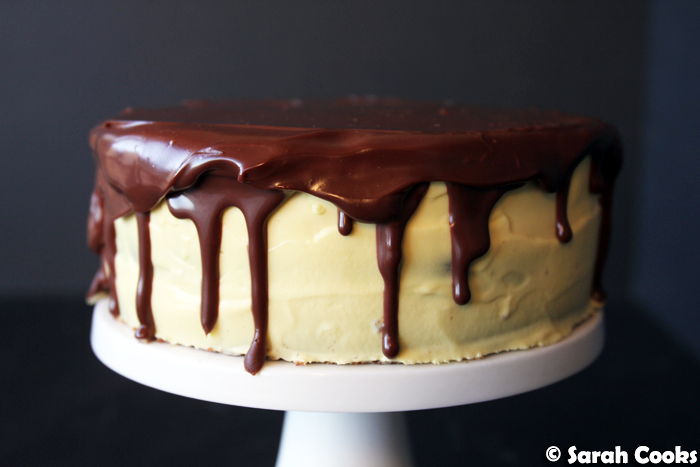 Place the cake in the fridge to chill for at least 30 minutes before topping with ganache. Note: Don't make the chocolate ganache until the cake is completely assembled and iced. Place the chocolate pieces in a heatproof bowl. Heat the cream, honey, and salt in a small saucepan. Once it comes to a gentle boil, turn off the heat and pour the cream mixture onto the chocolate. Allow to sit for 2-3 minutes, then stir until until the chocolate is completely melted and smooth. Allow the chocolate to cool slightly, or it will melt the icing. Too cold and it won't drip properly. Slightly above body temperature is just right. 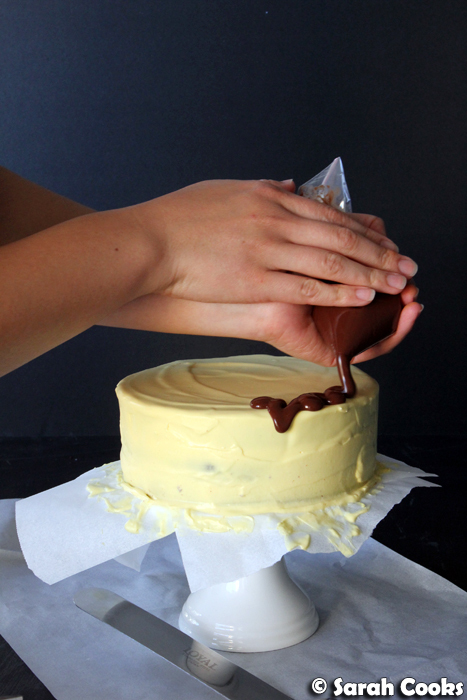 Place the ganache into a squeezy bottle, or a ziplock bag. Snip the tip off the ziplock bag, and pour the chocolate around the border of the cake, allowing it to drip down the edges. 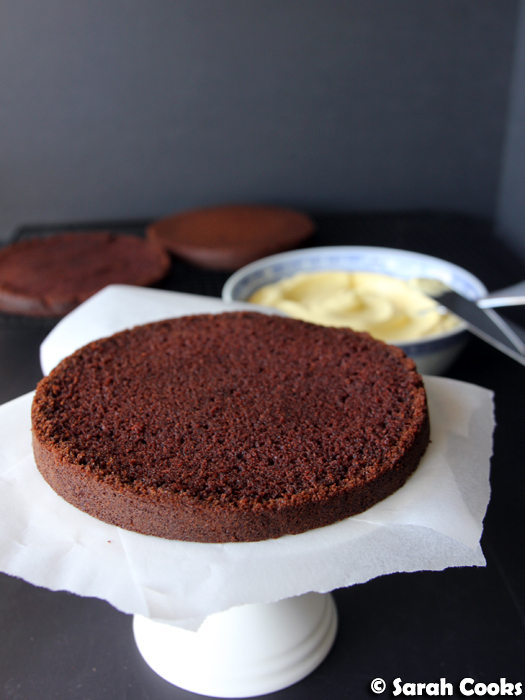 Once the perimeter is covered, fill the centre of the top of the cake with ganache. Smooth it flat with a clean spatula before it sets. Allow to set in the fridge before cutting into big slices to serve. What a beauty! I can't think of a better way to celebrate your blogversary - congratulations. Congrats on 14 years! That is an amazing accomplishment! The cake looks incredible. Thank-you Kim for your kind words!